Arsenal avoided a third straight Premier League loss by beating a lacklustre West Brom at The Hawthorns. The Gunners started the fixture with their lowest points tally after 12 games in 32 years, but Danny Welbeck's powerful header gave them victory. Welbeck - denied by a Ben Foster save in the first half - powered in Santi Cazorla's cross after half-time. West Brom came closest when Saido Berahino headed onto the bar during a late rally but were deservedly beaten. The Baggies have not scored a league goal for more than 300 minutes, and chants of "you don't know what you're doing" when manager Alan Irvine substituted Stephane Sessegnon will do little for confidence. In Arsenal, they faced a side under intense scrutiny following their own poor start to the season, but Arsene Wenger's side have now followed last weekend's defeat by Manchester United with two wins, including Champions League progress in midweek. They have reached the latter stages of that competition for 15 straight seasons, but that pattern contrasts with the inconsistency which hampers any title challenge, and banners calling for Wenger to leave his role were visible among the travelling support. His side are 11 points worse off than at this stage last season despite the additions of Alexis Sanchez, Calum Chambers and Welbeck - who was shifted out of the central striker's berth for Olivier Giroud - but produced the game's decisive moment. His header - one of 17 Arsenal attempts at goal - arrived after a first half in which Foster was the only goalkeeper called into action, denying Welbeck from 12 yards. The West Brom keeper then presented Giroud - back in the starting XI for the first time since breaking his leg in August - with an open goal near the corner flag, but the angle proved too acute. Arsenal looked solid with Laurent Koscielny back at the heart of their defence, and with all of their wins this season coming against sides in the bottom half, the breakthrough inevitably arrived. Cazorla was impressive throughout - completing 93% of his passes in the opposition half - and he crafted space to dig out a neat cross which Welbeck headed home from eight yards. Only Berahino had briefly threatened for the home side, and his header from six yards hit the woodwork. The closing five minutes was their best spell and Craig Gardner whistled a shot from range narrowly wide, but Arsenal held on for just a fourth win in 12 league games, to sit sixth in the table. BBC Match of the Day's Danny Murphy: "Today showed Danny Welbeck and Olivier Giroud can play in the same team. Welbeck started on the left and didn't throw his toys out, he worked as hard as anybody, he did not stop making runs. "They mixed up their positions really well and in the second half it was Welbeck who made the difference. He wants to get himself a goal and what a leap it was. Desire and application is undeniable. The quality, which some people question, was there as well." West Brom manager Alan Irvine on fans chanting after a substitution: "It's not nice to hear it but people have their own opinions and it very nearly worked. "We looked as if we might score when perhaps we didn't look like scoring too many times prior to the changes. Had it worked, perhaps people would have had a different judgement. We came close to getting something." Arsenal manager Arsene Wenger on some fans demanding he leaves: "I don't want to comment on that. I try to do my best for this club that I love. We are very united with the players and staff around the team, that's all you can do. "It's easier to deal with the upwards than the downwards, but you cannot be a manager and have only one side." Match ends, West Bromwich Albion 0, Arsenal 1. 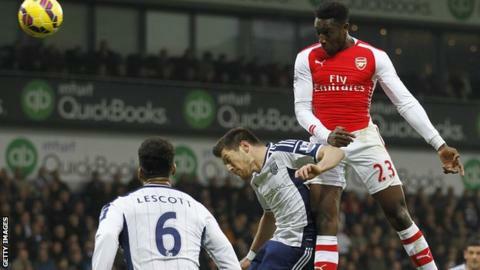 Second Half ends, West Bromwich Albion 0, Arsenal 1. Alex Oxlade-Chamberlain (Arsenal) is shown the yellow card for a bad foul. Cristian Gamboa (West Bromwich Albion) wins a free kick in the defensive half. Attempt missed. Aaron Ramsey (Arsenal) left footed shot from more than 35 yards misses to the right following a fast break. Corner, West Bromwich Albion. Conceded by Mathieu Flamini. Attempt missed. Craig Gardner (West Bromwich Albion) header from the left side of the box misses to the left. Assisted by Chris Brunt with a cross following a corner. Corner, West Bromwich Albion. Conceded by Aaron Ramsey. Attempt blocked. Craig Gardner (West Bromwich Albion) right footed shot from outside the box is blocked. Assisted by Graham Dorrans. Delay in match Alex Oxlade-Chamberlain (Arsenal) because of an injury. Corner, Arsenal. Conceded by Cristian Gamboa. Saido Berahino (West Bromwich Albion) hits the bar with a header from the centre of the box. Assisted by Cristian Gamboa with a cross. Attempt blocked. Chris Brunt (West Bromwich Albion) left footed shot from outside the box is blocked. Assisted by Victor Anichebe with a headed pass. Attempt blocked. Craig Gardner (West Bromwich Albion) left footed shot from outside the box is blocked. Attempt saved. Craig Gardner (West Bromwich Albion) right footed shot from outside the box is saved in the centre of the goal. Assisted by Chris Brunt. Substitution, West Bromwich Albion. Georgios Samaras replaces Stéphane Sessegnon. Corner, Arsenal. Conceded by Craig Dawson. Substitution, West Bromwich Albion. Cristian Gamboa replaces Sébastien Pocognoli because of an injury. Delay in match Sébastien Pocognoli (West Bromwich Albion) because of an injury. Delay in match Kieran Gibbs (Arsenal) because of an injury. Attempt missed. Aaron Ramsey (Arsenal) right footed shot from outside the box misses to the left. Assisted by Santiago Cazorla.